DUBLIN — Is a bathroom an optional extra when you’re at 30,000 feet? Ryanair boss Michael O’Leary seems to think so — and says his no-frills airline might charge customers to use its aircrafts’ toilets. O’Leary whipped up a frenzy of indignation and potty humor Friday as he suggested that future Ryanair passengers might be obliged to insert a British pound coin (U.S. $1.40) before they gain access to in-flight relief. As always when introducing new charges, O’Leary suggested a separate toilet fee would lower ticket costs and make flying, somehow, easier for all. Nobody, even his own aides, seemed to be sure if he was serious or pursuing his well-documented penchant for making brazen declarations to win free advertising. “One thing we have looked at in the past, and are looking at again, is the possibility of maybe putting a coin slot on the toilet door, so that people might have to actually spend a pound to `spend a penny’ in future,” O’Leary said, using a local euphemism for relieving one’s self. When asked, during an interview on BBC Television, what would happen if a customer really had to go, but didn’t have the correct change, O’Leary dismissed the scenario as implausible. This even though Ireland and most of Europe uses euros, not the British currency, and even on-board attendants often find themselves without the correct change. Politicians and analysts agreed that the man who pioneered charging airline customers to check bags, to use a check-in desk, and even to use a credit or debit card to make an on-line booking just might be serious about mile-high toilet extortion, too. Howard Wheeldon, senior strategist at BGC Partners in London, cautioned consumers that O’Leary might be attempting two for the price of one: Free publicity backed by cut-throat reality. “This begs a simple question retort of: Is there absolutely nothing that this airline won’t do? Not really, so if you are thinking about flying cattle-class Ryanair in future, beware,” he said. O’Leary’s own chief spokesman, Stephen McNamara, said his boss often spoke tongue in cheek — but then defended the idea of charging for a toilet as part of a logical trend. Rochelle Turner, head of research at British consumer rights magazine Which? Holiday, said Ryanair had a well-documented practice of “putting profit before the comfort of its customers” — but this one could backfire. “Charging people to go to the toilet might result in fewer people buying overpriced drinks on board. That would serve Ryanair right,” she said. Tommy Broughan, transport spokesman for Ireland’s Labour Party, said the toilet-charge idea had to be taken seriously. He noted that Ryanair last month began threatening customers with fines if they tried to carry on board a second bag regardless of size — even one filled with a just-purchased item from the airport’s duty-free shops. “When Ryanair introduced this euro30 extra duty-free charge, many passengers joked that next they would be charged for using the toilet — not realizing that this indeed seems to be the newest extra charge on Ryanair’s agenda,” Broughan said. On the recession-hit streets of Dublin, Ryanair-bound people waiting for the airport shuttle bus seemed resigned to the idea of paying for an O’Leary-provided potty. “Your only choice with Ryanair, really, is not to fly Ryanair. Your dignity goes out the window. If you have a complaint, they’re not programmed to care,” said Samantha Jones, a 30-year-old Welsh woman who has been using the airline to commute between her weekday Irish job and weekend boyfriend back home near Liverpool. The news channel has even posted a Google Earth view of Arthur Road jail and the cell where Kasab will be kept. Why would any one want to know the exact location of a terrorist? Perhaps Toral Varia (The Reporter) could answer this. Blogmantra has offered me to become a contributing author here, so I took no time in accepting it given the vast viewership of this blog. In the near future I will keep posting my own thoughts, articles, musings–really random stuff which I feel needs a shout out. and what better place to do it than here! Give me a visit at Randomly Organized. I hope you enjoy it as much as I like writing it! India on Friday became the fourth nation to have its flag flying on the Moon’s surface when Chandrayaan-1’s Moon Impact Probe device, – which has the Indian Tricolour painted on it – touched down. The 35-kilo payload crash-landed on the lunar surface at around 2030 hrs IST. The MIP has started sending its first signals to the satellite. There’s a lot tucked away inside the MIP. There’s a device to constantly check it’s height as it falls, another to check what the air on the moon is made of and even a video camera to photograph the moon from close range. 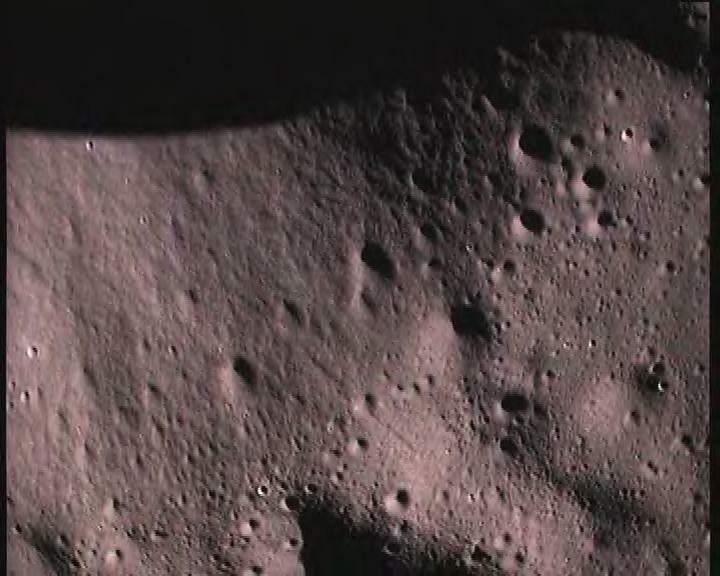 Those photographs will help ISRO decide where to land India’s first moon rover, a few years from now. The MIP also has the Indian flag painted on its sides a Sanskrit shloka as well. 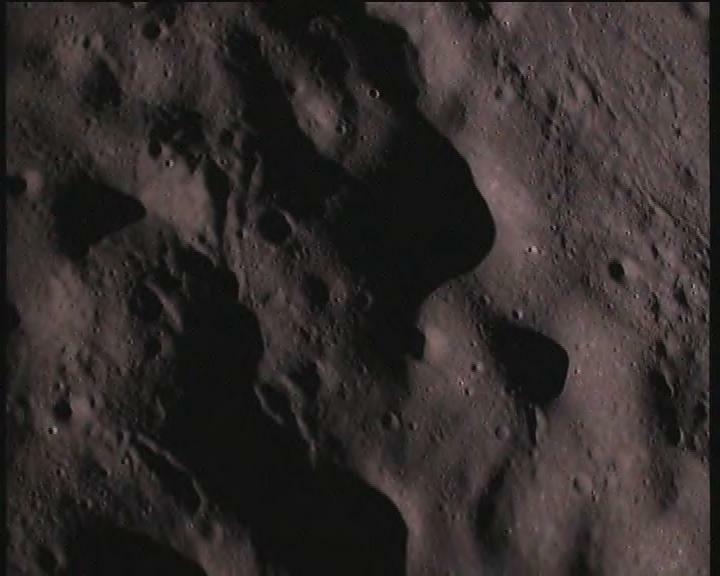 These two are close up pictures of the moon’s surface taken by Moon Impact Probe (MIP) on November 14, 2008 as it approached it after separating from Chandrayaan-1 spacecraft. Please note that these pictures are reproduced as received.